Summary: From the #1 New York Times bestselling author of the Shopaholic series comes a terrific blend of comedy, romance, and psychological recovery in a contemporary YA novel sure to inspire and entertain. I have been reading (and loving!) Sophie Kinsella's Shopaholic series for years -- sixteen I think. If you are familiar with these books, then you already know what a talented writer Ms. Kinsella is. She has created a memorable character in Becky, and Becky's adventures never disappoint. I always know that Ms. Kinsella's books can make me laugh! Ms. Kinsella has ventured away from Becky with quite a few stand-alone books, and I've enjoyed a few of them too. 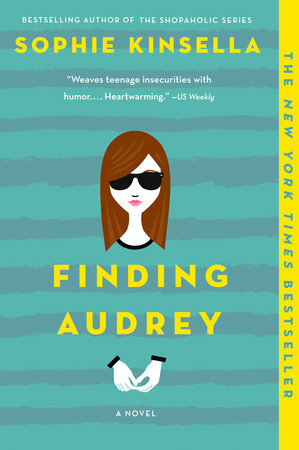 Given how she creates fantastic female characters, it just makes sense that she has written a book for young adults called FINDING AUDREY... and just in time for my sixteen year old daughter. I missed out on reading this novel when the book was initially released, but based on the great reviews, including a starred one from Kirkus, I knew I had to read it for the paperback release. FINDING AUDREY is the story of fourteen year old Audrey Turner, a teenage girl suffering from social anxiety order, told in her own words. She is unable to leave the house, doesn't like to make eye contact, and wears dark glasses even in her own house. It's apparent that Audrey has experienced something traumatic (most likely a being bullied) in her past, but she doesn't want to reveal it to the reader. Audrey regularly sees (or talks to) a therapist, but she still seems to be struggling to lead even a somewhat ordinary life. That is until Linus, her brother's good friend, shows up at her house. She immediately feels a connection to the sweet and sensitive Linus, and he eventually (through a lot of persistence) gets Audrey to open up to him. As their relationship progresses, she even visits a Starbucks and talks to strangers! With Linus's encouragement and support, can Audrey deal with her issues and possibly have a future with Linus? I thought FINDING AUDREY was a fun young adult read. I am a really big fan of Ms. Kinsella's, so I did have fairly high expectations for this novel... and it did not disappoint. I loved Audrey and thought the author created a wonderful character with her; however, I also thought Audrey's "messy" family was a lot of fun. And Linus? Well, Linus was just a terrific kid and exactly what Audrey needed! There are many great things about FINDING AUDREY! First and foremost is Audrey. She is a troubled girl that I couldn't help but adore. I felt her pain and wanted her to find some way to be "whole" again. I think teenage girls will definitely relate to Audrey, maybe not so much because of her social anxiety issues, but because she is a real girl with real friend problems. I also think that many young girls will be able to relate to her family as well as her newfound excitement with falling for a boy! As a mom, I just loved that the messages in this novel. I think teens need to see that mothers (even ones that are a little crazy) love their children and want what's best for them. I also appreciated the way Audrey and Linus's relationship was portrayed. Linus was such a good guy and I hope teen girls who read this novel will realize that there are good guys out there. Finally, I really enjoyed seeing the journey Audrey made on her path to healing. It wasn't always easy for her, but knowing that she had support from her family and friends definitely helped her and gave her the desire to branch out! And lastly, I loved how funny this book was. Granted, Audrey's story did have some very serious issues including bullying and mental health; however, Ms. Kinsella, once again, wrote a novel that was both touching and hilarious. Audrey's family provided much of the humor, especially her mom and her older brother. I couldn't help but laugh at her mother's attempt to stop her son from playing so many video games. The first scene in the novel is downright crazy! I am so glad that Ms. Kinsella has decided to write young adult novels. It's a perfect fit for her terrific writing! Highly recommended for fans of Ms. Kinsella and readers who enjoy heartwarming and funny stories. Thanks to the publisher for providing a review copy of this novel and for sponsoring this giveaway. Giveaway alert: I have a copy of FINDING AUDREY to share with one lucky reader. To enter, just fill out the form below before May 25th at 11:59 p.m. EST. I will randomly select and notify the winner the following day. This contest is open to those of you with U.S. addresses only. Good luck! I thought this book was cute but didn't love it as much as everyone else did.